To begin with Malcolm de Chazal was a writer and a poet. His most notable works were: Sens Plastique and Sens Magique… W.H.Auden an anglo-American poet said of him that he was “…the most original and interesting French writer to emerge since the war.” André Breton, known as the founder of surrealism, hailed Malcolm de Chazal as a surrealist. In 1950, at the suggestion of Georges Braque, he began to paint… Better known in the French-speaking world as an influential artist who stands alone in both his approach and his style, he is now becoming appreciated in the English-speaking world as a free-thinker who is deserving of his place in art history. It is said that there are a thousand lost Fauves, Chazal is surely one. Malcolm de Chazal was born in Mauritius in September 1902, the 13th and last child of Edgar de Chazal and Emma (nee Kellman). The family were french land-owning aristocracy in the Auvergne and the Loiret. They moved to the island of Mauritius in 1763 when the Comte Francois de Chazal de la Geneste and Antoine toussaint de Chazal de Chamarel established themselves there. The former, an intimate of the notorious comte de St Germain, was much interested in the occult. Francois de Chazal is supposed to have been the 'last depository' of the secrets of St Germain, to have started the order of the Rosicrucians and to have practiced, with unrecorded success the art of 'Lapis Animalis' or the changing of animals to stone and visa versa. Another specialty, the transmutation of bass metals to gold may have yielded better results. At any rate, the family (or should one say Dynasty) were extremely prosperous and influential on the island. Malcolms' mother was a grand daughter of James Cardew and daughter of a Major Kellman, whose regiment was posted to garrison Mauritius in the late 1800s. Emma de Chazal, english and deeply religious, exercised a profound influence on her children. The de Chazal family left the roman catholic church en bloc and embraced the doctrines of Emmanuel Swdenborg under the influence of Edmond de Chazal in or about 1860. This ancestor had a reputation as an economic and social reformer. He improved working conditions for the indentured labour in his sugar fields and factories and at the same time consolidated the family fortunes. 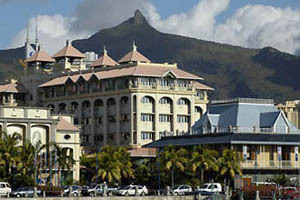 Chazal was at school at the Royal College at Curepipe in Mauritius, where he had a good record. Destined for the family sugar industry he went to Baton Rouge university in Louisiana where he qualified as a sugar engineer and Chemist (1931). On his way to U.S., he visited Sumatra, Java, then crossed Canada by the Canadian Pacific Railroad. While in Canada he made a winter trip up the frozen river Saguenay in Quebec province. He served an apprenticeship in the sugar industry in Cuba and returned to Mauritius via Europe in 1932 (aged 30). His first action on his return was to publish a blistering attack on the methods and economics of the Mauritian sugar industry (Nouvel Essai D'economie politique). To the horror of his family he then put the sugar industry behind him and settled down to a literary career. Apart from occupying for a time a minor post in the government telecommunications dept, he then dedicated himself to writing and painting. By the 1960s Malcolm de Chazal was unmarried and living in Curepipe in an attic flat kindly lent him by his lawyer brother Andre Robert. He started his day early and descended to the capitol Port Louis, where he rented a room at the national hotel. 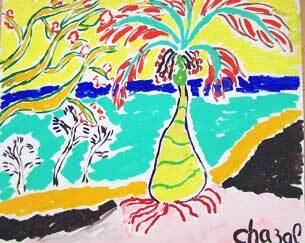 There he painted or wrote feverishly until the afternoon when he lunched mauritian style on curry and rice. In the late afternoons he would walk briskly in Port Louis or in the country, often visiting his favourite haunt, the central market of Port Louis. Sometimes a friend would drive him around the island as he had never himself been behind the wheel of a car. In the evening, M de C returned to curepipe where he supped and wrote at the hotel Vatel before going home. In general he avoided society and particularly celebrities and lived a frugal, regular and self disciplined existence. He had very few friends to whose houses he would occasionally accept an invitation to supper. Web site design by PBS © 2009 Y Armstrong. All rights reserved. All images on this web site have been published with the owners permission. All images are free to copy or use whilst the paintings are available on this site, but may not be used for commercial purposes without the express permission of the copyright owner.